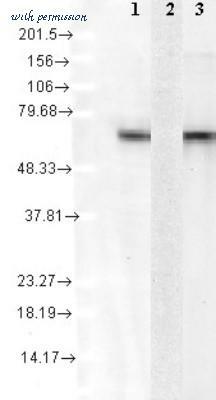 Western blot analysis of HSC70/HSP73: Lane 1: MW marker, Lane 2: HSC70/HSP73 (bovine), (recombinant) (Prod No. ADI-SPP-751) Lane 3: HSP70/HSP72 (human), (recombinant) Lane 4: 3T3, (Cell Lysate) (Prod No. ADI-LYC-3T100) Lane 5: PC-12, (Cell Lysate), (Prod No. ADI-LYC-PC100), Lane 6: CHO-K1 Cell Lysate, Lane 7: GPC-16 Cell Lysate, Lane 8: HeLa, (Cell Lysate) (Prod No. ADI-LYC-HL100). 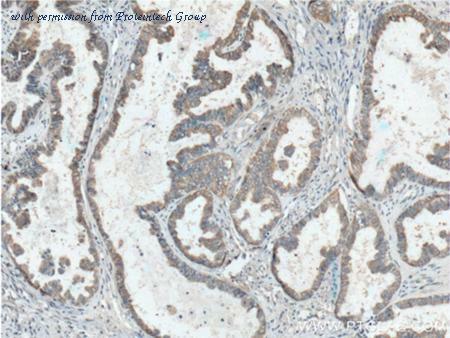 Immunohistochemistry analysis of human spleen tissue stained with HSC70/HSP73, mAb (1B5) at 10µg/ml. 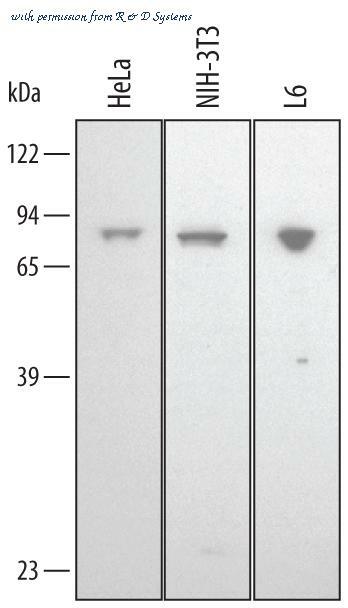 Western blot analysis of Heat Shock Protein 70 (HSP70) was performed by loading 50µg of the indicated whole cell lysates and 15µl of PageRuler Prestained Protein Ladder (Product # 26616) onto a 4-20% Tris-HCl polyacrylamide gel. Proteins were transferred to a PVDF membrane and blocked with 5% BSA/TBST for at least 1 hour. The membrane was probed with a HSP70 monoclonal antibody (Product # MA3-014) at a dilution of 1:1000 overnight at 4°C on a rocking platform, washed in TBS-0.1%Tween 20, and probed with a goat anti-mouse IgM-HRP secondary antibody (Product # 31440) at a dilution of 1:20,000 for at least 1 hour. Chemiluminescent detection was performed using SuperSignal West Pico (Product # 34080). Immunofluorescent analysis of Heat Shock Protein 70 using Heat Shock Protein 70 Monoclonal antibody (13D3) (Product# MA3-014) shows staining in NIH-3T3 cells. Heat Shock Protein 70 staining (green), F-Actin staining with Phalloidin (red) and nuclei with DAPI (blue) is shown. Cells were grown on chamber slides and fixed with formaldehyde prior to staining. Cells were probed without (control) or with or an antibody recognizing Heat Shock Protein 70 (Product# MA3-014) at a dilution of 1:20-1:200 over night at 4 ?C, washed with PBS and incubated with a DyLight-488 conjugated secondary antibody (Product# 35552 for GAR, Product# 35503 for GAM). Images were taken at 60X magnification. 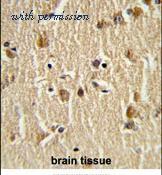 Immunohistochemical analysis in formalin-fixed and paraffin-embedded human brain tissue followed by peroxidase-conjugated to the secondary antibody, followed by DAB staining. Flow cytometric analysis of Hela cells (bottom histogram) compared to a negative control cell (top histogram). FITC-conjugated goat-anti-rabbit secondary antibodies were used for the analysis. 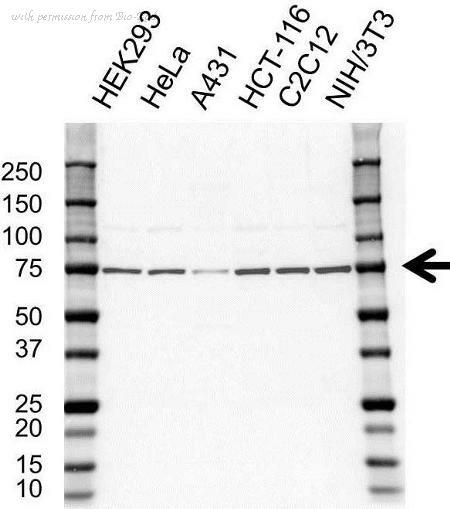 Western blot analysis of HSPA8 in Hela cell line lysates using 35ug per lane of antibody. 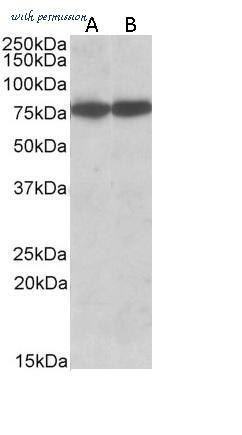 The Hsc70 antibody from Proteintech is a rabbit polyclonal antibody to a recombinant protein of human Hsc70. This antibody recognizes human,mouse,rat antigen. 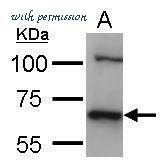 The Hsc70 antibody has been validated for the following applications: ELISA, IF, IHC, IP, WB analysis. 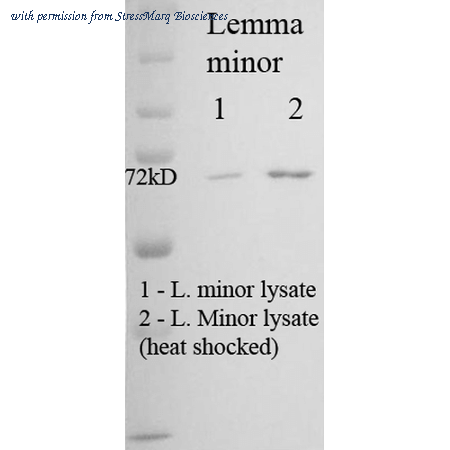 Western Blot analysis of Duckweed (Lemma minor) Heat Shocked cell lysates showing detection of Hsp70 protein using Mouse Anti-Hsp70 Monoclonal Antibody, Clone 5G1-95 (SMC-120). 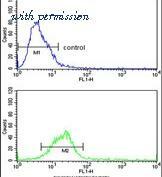 Primary Antibody: Mouse Anti-Hsp70 Monoclonal Antibody (SMC-120) at 1:1000. 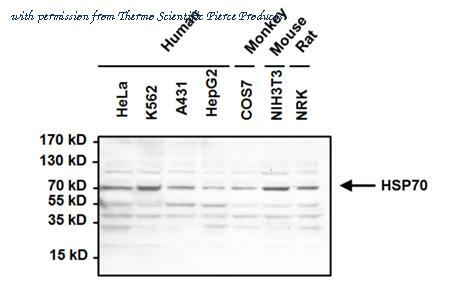 Detection of Human/Mouse/Rat HSPA8/HSC71 by Western Blot. Western blot shows lysates of HeLa human cervical epithelial carcinoma cell line, NIH-3T3 mouse embryonic fibroblast cell line, and L6 rat myoblast cell line. PVDF membrane was probed with 1 ╡g/mL of Goat Anti-Human/Mouse/Rat HSPA8/HSC71 Antigen Affinity-purified Polyclonal Antibody (Catalog # AF4148) followed by HRP-conjugated Anti-Goat IgG Secondary Antibody (Catalog # HAF017 ). 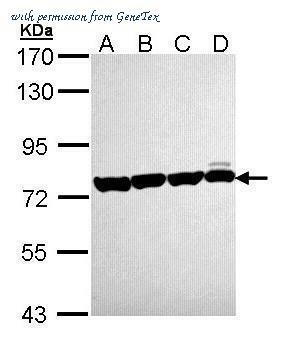 A specific band was detected for HSPA8/HSC71 at approximately 71 kDa (as indicated). 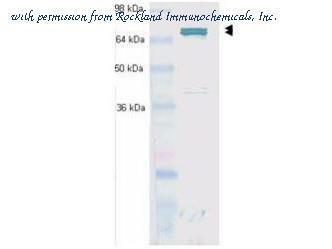 This experiment was conducted using Immunoblot Buffer Group 2 . 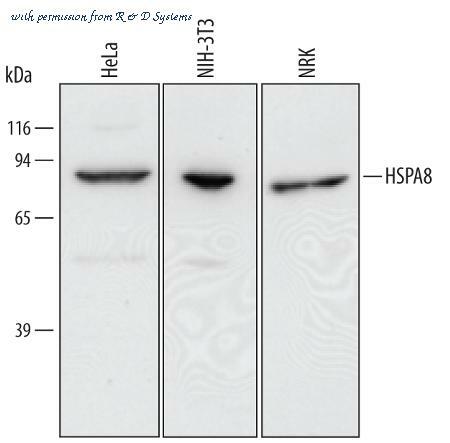 Detection of Human/Mouse/Rat HSPA8/HSC71 by Western Blot. Western blot shows lysates of HeLa human cervical epithelial carcinoma cell line, NIH-3T3 mouse embryonic fibroblast cell line, and NRK rat normal kidney cell line. PVDF membrane was probed with 0.1 ╡g/mL of Mouse Anti-Human/Mouse/Rat HSPA8/HSC71 Monoclonal Antibody (Catalog # MAB4148) followed by HRP-conjugated Anti-Mouse IgG Secondary Antibody (Catalog # HAF007 ). A specific band was detected for HSPA8/HSC71 at approximately 75 kDa (as indicated). This experiment was conducted under reducing conditions and using Immunoblot Buffer Group 2 . Hsc70 (1F2-H5), Human cell line mix(1), rHsp70 (2), rHsc70 (3). This image was taken for the unconjugated form of this product. Other forms have not been tested. 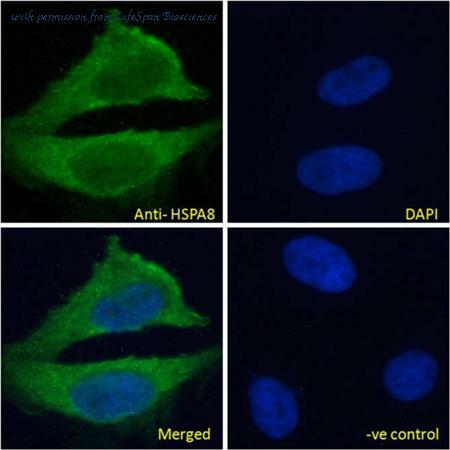 HSPA8 / HSC70 antibody (0.03µg/ml) staining of HepG2 (A) and NIH3T3 (B) cell lysate (35µg protein in RIPA buffer). Detected by chemiluminescence. 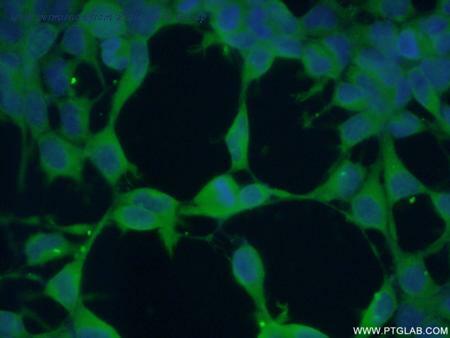 HSPA8 / HSC70 antibody immunofluorescence analysis of paraformaldehyde fixed HeLa cells, permeabilized with 0.15% Triton. Primary incubation 1hr (10ug/ml) followed by Alexa Fluor 488 secondary antibody (4ug/ml), showing cytoplasmic staining. The nuclear stain is DAPI (blue). Negative control: Unimmunized goat IgG (10ug/ml) followed by Alexa Fluor 488 secondary antibody (2ug/ml). 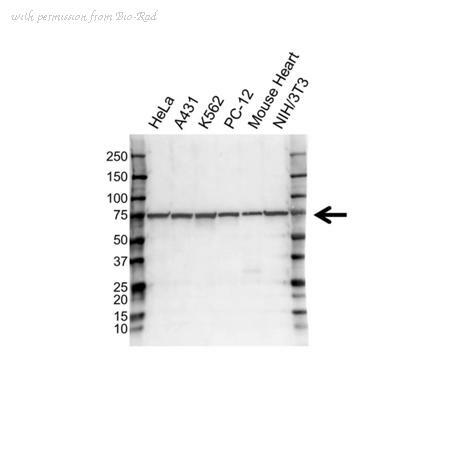 Western blot using Rockland's Protein G purified anti-Hsc70 (Hsp73) antibody shows detection of Hsc70 (Hsp73) in whole cell lysates from heat shocked HeLa cells. The band marked by the double arrowheads corresponds to Hsc70 (Hsp73) at an approximate molecular weight of 72/73 kDa. The primary antibody was used at a 1:1,000 dilution. 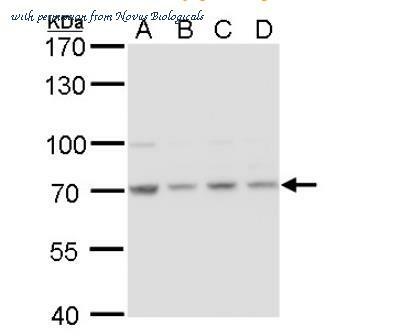 Western Blot of rabbit anti-Hsc70 (Hsc73) antibody. Lane 1: Human cell line mix. Lane 2: none. Load: 35 µg per lane. Primary antibody: Hsc70 (Hsc73) antibody at 1:1000 for overnight at 4°C. Secondary antibody: IRDye800™ rabbit secondary antibody at 1:10,000 for 45 min at RT. Block: 5% BLOTTO overnight at 4°C. Predicted/Observed size: 70.9 kDa, ~70 kDa for Hsc70 (Hsc73). Other band(s): none. 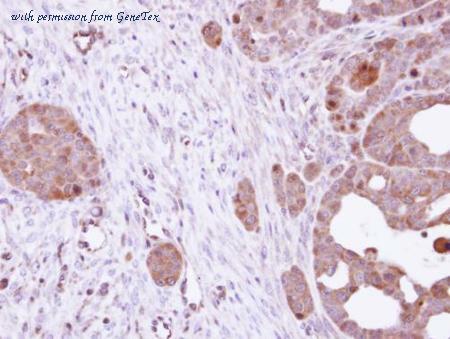 Immunohistochemical analysis of paraffin-embedded NCIN87 xenograft, using HSC70(GTX111150) antibody at 1:500 dilution. 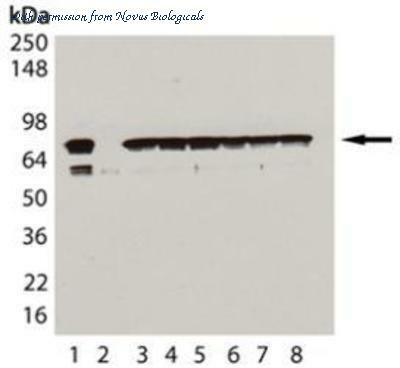 Western Blot: HSPA8/HSC71/Hsc70 Antibody (1F2-H5) [NBP2-12880] - analysis of Human Cell lysates showing detection of Hsc70 protein using Mouse Anti-Hsc70 Monoclonal Antibody, Clone 1F2-H5 . Load: 15 ug protein. Block: 1.5% BSA for 30 minutes at RT. Primary Antibody: Mouse Anti-Hsc70 Monoclonal Antibody at 1:1000 for 2 hours at RT. Secondary Antibody: Sheep Anti-Mouse IgG: HRP for 1 hour at RT. 1: mix of 10 different human cell lines, 2: Hsp72 recombinant protein, and 3: Hsc70(Hsp73) recombinant protein. Western blot analysis of whole cell lysates probed with Hsc70 antibody followed by detection with Goat anti Human IgG F(ab')2:HRP (1/2,500, STAR126 ) and visualized on the ChemiDoc MP with 1 second exposure. Arrow points to Hsc70 (molecular weight 73 kDa).